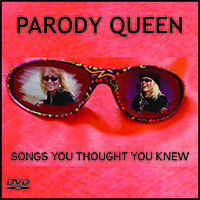 Parody Queen aka Denise Abernethy, has created this 15 parody video set taken from her collection of parodies from her first two albums. Some of the videos have been stolen out of her secret vault from years ago, but are just as fun as her newer songs. Songs You Though You Knew is sure to become a cult favorite. Click on the below links to check them out. Be sure to get your DVD or USB today!